The name of Playa Honda translated to english as Slingshot and it is situated in the resort of Playa de las Americas. On some maps and guides you will even find it under the name of Playa Las Americas. Honda beach is not very popular, given the fact that is is located between Troya Beach and Playa del Camison, which both offer better conditions and more facilities. You will still find sun loungers and umbrellas, but they are a lot fewer than in other places. 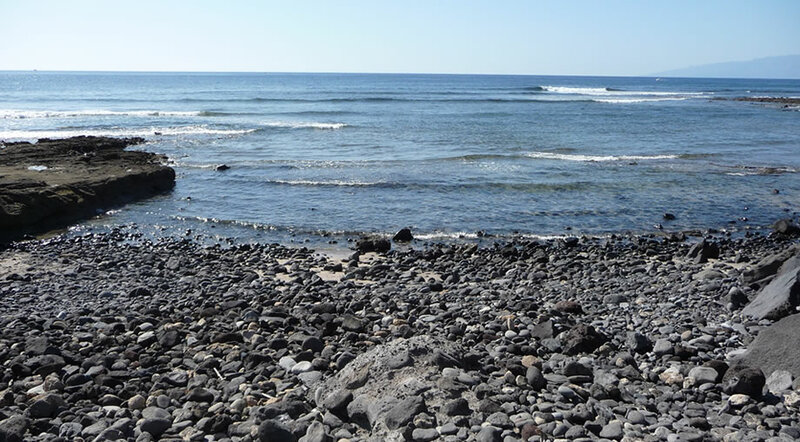 Playa Honda is smaller than the other two beaches in las Americas and the conditions for swimming and sunbathing are not favorable either. The beach is rocky, has many pebbles and coarse dark sand, which makes it less of a favorite for tourists who come here just to relax. Surfers however love this beach, as the swell is sometimes just right and there aren’t many people in the water either most of the times. Surfers also call this beach El Dedo, which translates to The Finger, referencing the big rock that enters the ocean, which marks the spot for the best surfing conditions. Honda Beach is the place to come only if you want to get away from the crowds in Playa de las Americas but you don’t want to leave the resort itself. There are still plenty of shops and restaurant nearby, so you can have lunch with views of the ocean and then return to your sun lounger for more tanning.